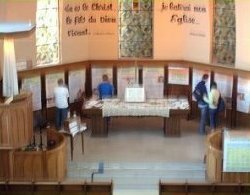 Each summer during August a Bible Exhibition (Expo-Bible) is held in the seaside town of Houlgate in Normandy at Houlgate Evangelical Church (l'Eglise Evangélique d'Houlgate). During the two weeks or so that it is open to the public there are several hundred visitors to the Expo. Whether through reading the reading the forty exhibition panels, or taking away free literature or gospels, or buying a book or Bible, or talking with a team member, it has been a wonderful opportunity to introduce visitors to the Bible, to the gospel, and to the Lord Jesus Christ. The aim of this annual Expo-Bible is to reach as effectively many people as we can with the message of the Bible amd the gospel in a way that is culturally acceptable in France but also in a way that has a big impact on those who visit the exhibition. The exhibition takes visitors through the Bible, its history, its message and its contents. At the heart of the exhibition is the message of the Gospel, of the work of the Lord Jesus Christ on the cross to save sinners. The exhibition concludes with testimonies from those who have found new life in Christ, and recommendations that visitors should read the Bible for themselves in order to find out more about it and its contents and particularly about the one to whom the Bible points: the Lord Jesus Christ. 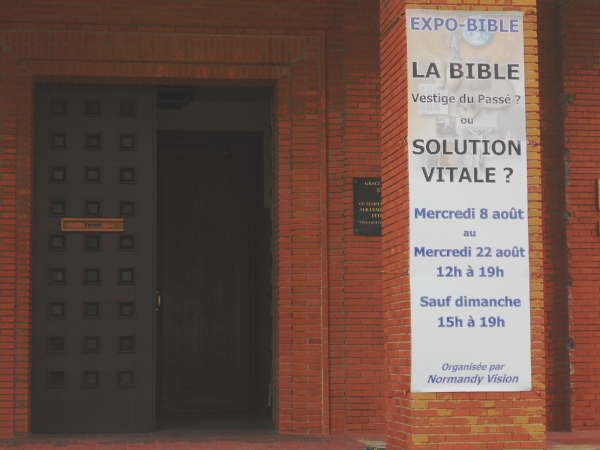 Read a report of the sixth annual Expo-Bible (Bible Exhibition) at Houlgate Evangelical Church in Normandy held during the summer of 2013. Read a report of the fifth annual Expo-Bible (Bible Exhibition) at Houlgate Evangelical Church in Normandy held during the summer of 2012. Some visitors take up to an hour to go round the exhibition, reading everything very carefully. Many of these are not Christians, and by the time they have completed the tour they want to take some of the free Christian literature and Gospels that are available, or to buy a Bible or other Christian book to help them understand and learn about the Bible. We sell many Bibles and Christian books each year. Many of the Bibles are bought by people who had never read or owned a Bible before. In addition, several hundred tracts and Gospels are taken by visitors or given out by team members during conversations with visitors.